On 28.06.2013 SC "Kyokushin" Shumen was host to an exam for a higher level of technique /kyu/ in Shinkyokushin karate. 80 karatekas from Shumen, Novi Pazar, Veliki Preslav, Tzarev Brod and Nikola Kozlevo endured this difficult challenged, Shumen having 50 representatives. sensei Rumen Kalinov - III dan, senpai Stoian Obretenov - II dan, senpai Ivan Bezus - II dan and senpai Daniel Dimitrov - II dan. The duration of the exam was three hours, containing the three main components of Shinkyokushin karate - kihon, kata and kumite, as well as an overwhelmingly difficult test of their physical qualities. All participants passed successfully, showing great technical growth, strong fighting spirit an excellent physical conditioning. On 21.05.2013 the Shumen "Bishop Konstantin Preslavski" celebrated it's patronal festival with a special program. On the occasion of the International Collaboration Center's holiday as well as the projects of the Shumen university and the Japanese association for international cultural exchange with lectors on japanese language and culture and Mss. Senda, was organised a Japanese Culture day. The event began with demonstrations in japanese martial arts /Shinkyokushin karate, Jiu-jitsu, aikido and kendo/ featuring SC "Kyokushin" Shumen with chairman Stoian Obretenov, Aikido Club Zan-Shin with chairman Severin Akerski, Kendo Club Shumen with chairman Dobromir Draev. After that in a specially prepared conrner Mr. and Mss. Senda and students from the university presented japanese culture, traditional japanese clothes, caligraphy and origamy, as well as traditional japanese cuisine, which everyone could sample. On 11.05.2013 in the "Asenovets" hall in Asenovgrad were held the National championships in Shinkyokushin karate for children up to 10 and 14 years of age. The competition was very strong, the two tatami were worn out by the matches of 200 children from clubs of the whole country, members of the Bulgarian Karate Shinkyokushin Federation. SC "Kyokushin" Shumen made an exceptionally strong performance, winning 4 gold, 4 silver and 4 bronze medals. 1.Ioana Terzieva in the children 10 years 30kg category, who fought an excellent final against Duigu Ikmet from SC "Kyokushin" Novi Pazar. 2.Kaloian Kolev in the children 10 years 32kg category, who won his first match by vazaari, the second by ippon, in the semifinal vazaari again and a brilliant final match, which Shumen's young karateka won with ippon after a very strong low kick. 3.Gunai Galibov in the children 14 years 42kg category, who won hsi final with vazaari. 4.Dian Petkov in the children 14 years 39 kg category, who outclassed his opponents and won his semifinal and final with ippon after a well placed chudan mawashi geri. 1.Ivan Ivanov in the children 10 years 28kg category, who won his first match and semifinal with vazaari after excellently executed djodan mawashi geri. 2.Kaan Shukri in the children 14 years 45kg category. 3.Nesrin Nezhdet in the children 14 years 45kg category, who showed great growth in her game, winning her first match with ippon. 4.Aigul Ibriam in the children 14 years 55kg category, for whom this was her debut in karate competiton. 1.Serpil Galib in children 14 years of age. 2.Arzhu Fikretova in children 14 years of age. 3.Zhaneta Russeva in children 14 years of age. 4.Roberto Vasilev in children 14 years of age. 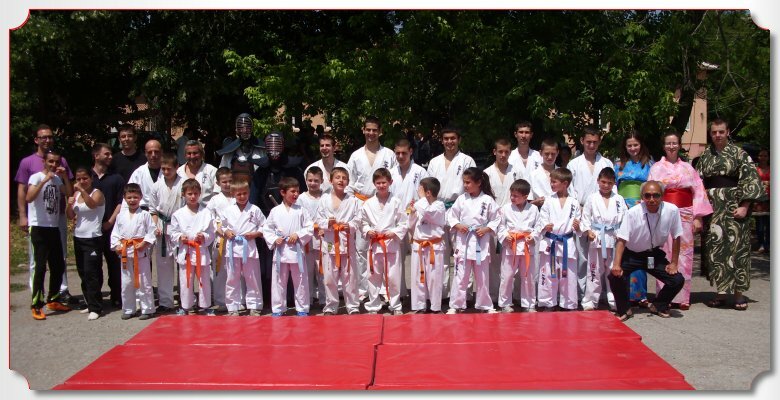 The competitors of SC "Kyokushin" Shumen were able to take part in the National championships for children up to 10 and 14 years of age thanks to the timely help of the Municipality of Shumen.